Like many audiophiles, my audio journey has taken many twists and turns. Never satisfied, I've read a lot, listened a lot, and bought and sold a lot. I discovered SET tube amps pretty recently and fell in love with the utterly natural, romantic sound I heard from them. Finally I had discovered the be-all end-all component that would allow me to just kick back and enjoy the tunes. I bought one and I was loving it. Until it caught on fire. To be fair, there were no flames but there was a lot of thick grey smoke and a nice panic smack in the face. By this I could not abide. So I went back to the drawing board at least armed with the knowledge of a type of amp that really worked for me. Long story short, I found the First Watt SIT-2 for my main system and lived happily ever after. Unless I was on headphones in my office. 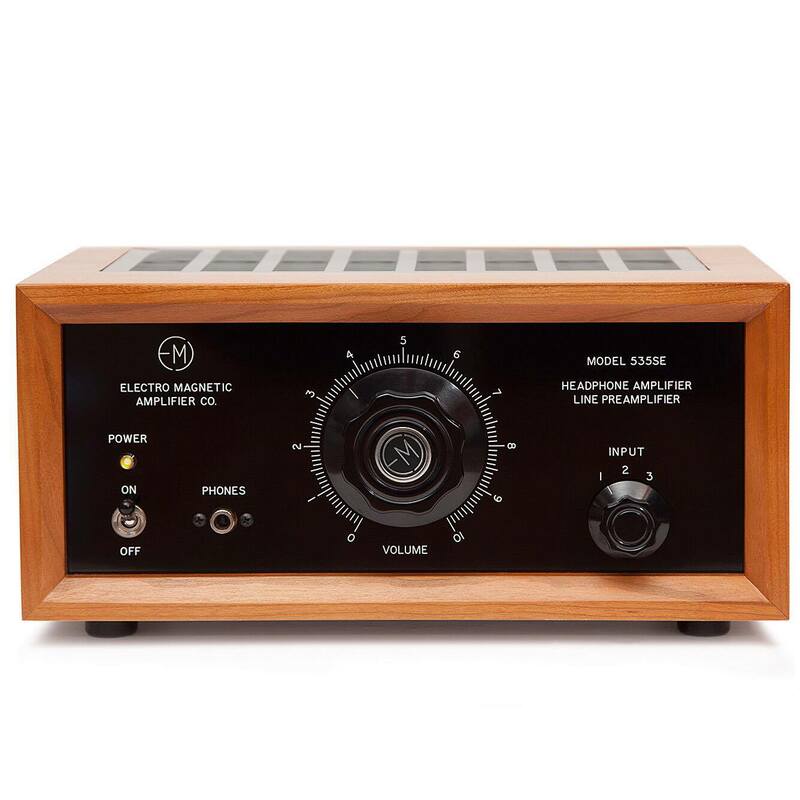 I started digging around for a "solid state headphone amp that sounds like an SET" and I came up with the Eddie Current Black Widow and the unreleased Electro Magnetic Amplifer Co 535SE. I bought the Black Widow and liked it better than my Auralic Taurus MkII. It has a nice laid-back, natural sound that I like a lot. As Craig told me "the BW is as close as you'll get" to SET sound from solid state on headphones and as far as I can tell he was right. Sure it's not all that SET is but it's solid state, it really shouldn't burn my house down, and most importantly I won't worry about it burning my house down. Time passed until Steve Eddy of EMAC caught up with me and offered to send me his prototype 535SE amp for review. Of course I couldn't pass this up since Steve and I had conversed previously about how this amp would be built with a goal of not only equaling the SET sound I loved but besting it. I was satisfied with my setup (finally) and I could have lived it out happily with the Black Widow but this was a potentially disruptive chance worth taking. The big day arrived and I unboxed it. It's big and beautiful. It looks and feels a lot different than any other headphone amp I've seen or touched. It's like a piece of fine (and retro) furniture. The look of the thing along with the click of the power switch, spin of the volume dial, and the turn of the input selector added up to leave me with the impression that someone agonized over the details and produced something very special. I'll pause here to quickly mention that my DAC is a battery-powered Red Wine Audio Bellina. The SETs I've heard are the fiery Opera Consonance Cyber 30 and the Woo Audio WA6-SE. Not over the top SETs but enough to send me to the moon. The big moment came and I listened in eagerly. What struck me first was the soundstage which was huge. Like my head got way bigger or at least way wider. Next the detail and noise floor. It gave me the impression that I was hearing to the bottom of the recording the way it felt the first time I used a Zerodust on the stylus in my vinyl setup after who knows how much stubborn dust and funk had previously accumulated onto it. Next was the note decay which was luscious and completely SET-like. These attributes combined to make for an incredible experience. I could go on but it was just one of those times when you're hearing music sound better than you've ever heard it before and your jaw does in fact drop. It's certainly the best headphone amp I've heard and I intensely look forward to listening every day that it's here. sheldaze, Currawong, nick n and 2 others like this.